I’ve been on a fairly good roll the last few weeks with getting stories done, but consequently it’s hard to keep up with the explanations so some of these were posted a few weeks ago. That said, if you have any questions about a specific story, just let me know and I’d be happy to explain. As always, the six word story is the caption under the photo and the explanation follows the caption. So many methods to crush dreams. 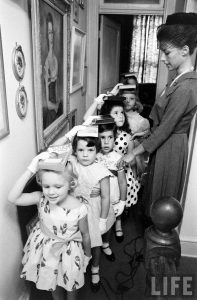 I suppose the irony between the story I wrote and the actual context of the photo is that the adults in the story probably felt they were helping these little girls achieve their dreams. Hey, this is the best grooming and preparatory school in the country! They don’t just carry these books around on their heads, they read them. Read them! Can you imagine? A contemporary photo would be something from Dance Moms. The only problem is, who decided whatever dream these kids are pursuing here is a good one? And what about the kids who wanted to do something else? Well, unfortunately, sometimes the real world doesn’t work that way. We don’t always get to do what we want, but that’s still a pretty tough lesson. Fortunately, or not I guess, there are lots of ways available for adults to get across to kids that not everyone gets to be an astronaut. My accompanying story was all about that grey space between dreams and reality and the consequences of dropping our childhood dreams as we grow into adults. The story happens forty years in the future from this photo and the protagonist – second from the front and looking straight at the camera – is reflecting how she really wanted to be a veterinarian, but wasn’t able to because that wasn’t acceptable through the boarding school she attended. She fought it for awhile, and still had a good life, but always had that regret. She stumbles across this photo at a period in her life when she feels dead inside and begins to recover a child-like fascination with the world. And now you know, the rest of the story. Ronald McDonald is crushing it. And that’s probably just a warmup set. Whatever it is, the important thing is that whoever this guy is, he’s making the most of his time to stay in shape. My first impression of this prompt was to think how silly it is. 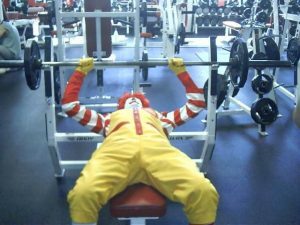 Ronald McDonald in the gym, working out, I mean The Mascot for fast food is probably not that concerned about his physical health. But this isn’t actually Ronald McDonald, it’s some guy dressed up as him. And that guy has all the concerns every other person has. He wants to put food on the table sure, but there’s also another job he’d rather be doing. He’d also like to have more time to spend with his family. And he’s concerned about his health and every day he’s torn in a hundred different directions and runs out of time with half of his to-do list accusing him of being inefficient. So he tries to hit two birds with one stone whenever and wherever he can. This guy works four jobs, one of which is clowning around as the mascot for McDonald’s. All that work doesn’t leave him much time for anything else, so he steals gym time whenever he can and sometimes that means going to the gym in his Ronald McDonald outfit. That’s actually as far as I took the story, but writing this out now, the story could easily see this guy succeed through hard work and yet still maintain time for all the things that are important to him. Like his daughter, who suffers from cystic fibrosis. Self-images don’t always match reality. This photo brought a smile to my face and maybe that’s why I liked the story I developed (although had I taken more time, I might have changed it to, ‘Self-image doesn’t always match reality.’) I mean, who hasn’t flinched when a bird randomly dive bombs you? That parakeet is absolutely terrifying this gentleman and it’s the type of picture that could easily become a meme that would be the bane of this guy’s existence. In fact, I saw this photo as the mirror moment in this guy’s life, when he’s confronted with the reality that he may not be who he thought he was. The story I came up with is a riff on The Secret Life of Walter Mitty. The guy in the photo has an equally normal and unimpressive life, doesn’t do much that would be considered exciting, and like Walter Mitty, he dreams of busting out of his shell. So, he starts branching out. He gets into long distance running, and adventure racing. He’s feeling good about himself. He meets a girl and takes her out. 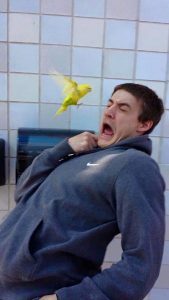 Then a rabid parakeet attacks! A bystander captures the moment and up it goes on Instagram for all the world to see. He’s humiliated. He can’t go any lower. Then a funny thing happens. The girl he met doesn’t reject him for the loser he thinks he is. She finds the photo funny, sure, but seems to like him all the more. With her help, he learns to stop taking himself so seriously. And they all live happily ever after. Except the bird. The bird continues to dive bomb people because it’s just miserable and cantankerous. It takes all kinds, right? “Better or worse,’ no truer words. The groom’s face speaks volumes. At least I assumed it was the groom. 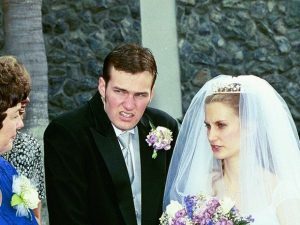 Whoever he is, the distaste on his face is so powerful it actually draws attention away from the bride’s face, and she doesn’t look too thrilled either. But to cut to the chase, this story is obviously going to revolve around why both these people look like the lady in blue just let rip a massive fart. The easy story here is, ‘regrets. They’ve got a few.’ Neither of these two are all that thrilled about the marriage. Maybe it’s a shotgun wedding, or maybe they need to get married to win some sort of bet, but for whatever reason, this isn’t a joyous occasion. But then, surprise, surprise, they end up falling in love and living happily ever after. Classic comedic girl meets boy, girl hates boy, girl marries boy to claim a massive inheritance, girl and boy fall in love and we’re good. That wasn’t the story I went with (although in retrospective it actually sounds a bit better). No, in my story these two are very much in love with each other. At least at this point. They spared no expenses on the wedding, and even hired the most expensive photographer they could find. Turns out, this photographer has some strange techniques, including the ‘frowny face’ technique, which is when she gets the subjects to relax by having them deliberately put on a sour face. As a laugh, the photographer provides the joke photos to the wedding couple along with the so-called good photos. Only in this case, the happily married couple can’t get over the frowny photos. The bride is convinced the groom couldn’t pretend to look this disgusted and their marriage begins to fall apart before it’s even begun. Just when they’re about to call it quits, they find themselves looking at these photos again and realize how funny they are, and that helps them come back from the brink. Meh. That’s it, hope the explanations were useful! Last point, I’d like to thank Twitter user @AgathaChocolats for the daily writing prompts as this would be much harder without your help.